Home OPINION “Probable cause”, “rule of law”, “due process”—new jargon for trumped up charges? “Probable cause”, “rule of law”, “due process”—new jargon for trumped up charges? The arrest of former Bayan Muna representative Ka Satur Ocampo, ACT Teachers Partylist Rep. France Castro, Pastors Edgar Ugal, Ryan Magpayo and Jurie Jaime of the United Church of Christ in the Philippines, and Eller Ordeza of the United Methodist Church and 12 other participants of the National Solidarity Mission has “probable cause” according to Gen. Edgar Arevalo, the spokesperson of the Armed Forces of the Philippines (AFP) in an interview with DZMM on December 1, 2018. “The rule of law must always prevail in a democracy,” he added. “They had, in fact, responded to the ‘cry of the needy’, the call of the Salugpongan schools for rescue in the midst of forcible closure and embargo by the army and allied paramilitary. The police ought to rethink how to best safeguard the rights of the Lumad. Why come after those carrying books and food supplies to teach and feed, when they should go after the paramilitary with guns and batons who terrorize and maim the Lumad?” Atty. Pastores argued. Are “probable cause”, “rule of law”, “due process”, and other legal jargon new catchphrases to be invoked by the violators of human rights? But the Duterte regime has no moral authority to invoke the rule of law when the National Solidarity Mission was pushed to help Lumad students and teachers in Talaingod from state harassment. What else can be invoked by the state forces? Why not try some provisions in the United Nations Declaration on the Rights of Indigenous Peoples (UNDRIP)? “Article 1- Indigenous peoples have the right to the full enjoyment, as a collective or as individuals, of all human rights and fundamental freedoms as recognized in the Charter of the United Nations, the Universal Declaration of Human Rights and international human rights law. “Article 2 – Indigenous peoples and individuals are free and equal to all other peoples and individuals and have the right to be free from any kind of discrimination, in the exercise of their rights, in particular that based on their indigenous origin or identity. “Article 3 – Indigenous peoples have the right to self-determination. By virtue of that right they freely determine their political status and freely pursue their economic, social and cultural development. “Article 4 – Indigenous peoples, in exercising their right to self-determination, have the right to autonomy or self-government in matters relating to their internal and local affairs, as well as ways and means for financing their autonomous functions. These provisions must be considered by the Duterte regime in its continued implementation of its counterinsurgency program Oplan Kapayapaan. Dividing the Lumad communities in Talaingod by “sowing intrigues, forced signing of blank papers, registering for attendance and it turned out as petition to close the Lumad school” in the name of the government’s counter-insurgency violates the rights of the indigenous people. The Philippines is a signatory of the UNDRIP. The Duterte regime must respect, uphold and implement the UNDRIP. Any program of the government that affects and destroys the life and rights of the Indigenous People must be stopped. The Duterte regime must hear the cry of the Lumad to end martial law and save their schools. 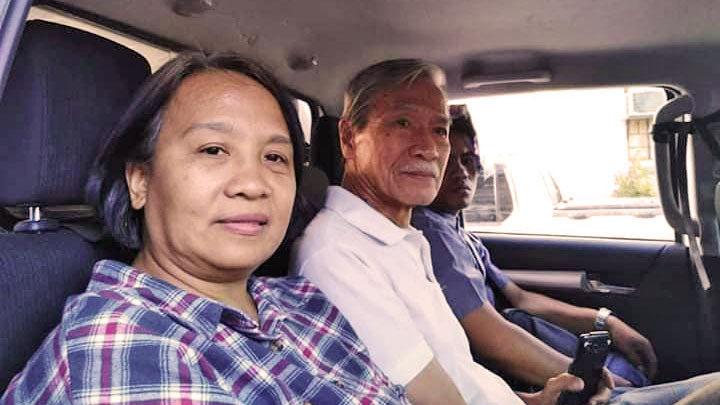 As to the case of the Ka Satur Ocampo, ACT Teachers Partylist Rep. France Castro, Pastors Edgar Ugal, Ryan Magpayo,and Jurie Jaime, of the United Church of Christ in the Philippines, and Eller Ordeza of the United Methodist Church and 12 others, eventually, lawyers say it will be dismissed—but not without more incidents of harassment. Filing of trumped up charges against the people who responded for humanitarian reasons is condemnable in the strongest terms. This incident demonstrates the lack of justice and true democracy in our country. The Filipino people must continue to call and act for just and lasting peace in the country where we can rid our society of these injustices against the Lumad and against good Samaritans trying to help others in need.